Gout is traditionally known as the ‘rich man’s disease’ or the ‘disease of the kings’. It is very painful and traumatizing condition and affects the joints of the body. The symptoms of gout include re-occurrence of painful swelling, reddening, heating and softening of the joints or acute inflammatory arthritis. Gout affects the base of the feet, mainly the base of the large toe. Gout is caused when there is an increased build up of uric acid in the blood or due to hyperuricemia. As the level of uric acid in the blood increases, it turns in to crystalline form and accumulates on the tendons, joints and on the tissues around it. As the uric acid level increase in the body, the pain and other symptoms associated with gout also increase. Patients suffering from gout take non-steroidal anti-inflammatory medications, colchicines, pain relievers and steroids to treat this disease. You can also treat it naturally by following a proper life style and taking healthy diet. This way you can get relief from the pain associated with gout and teat it properly. Some of the foods and beverages aggravate the symptoms of gout. So, you must be careful about the food and beverages that you choose when you suffer from this disease. Try to avoid foods that are not suitable. Below are a few diet tips that will help you control gout. When you consume saturated fat in excess, the ability of the body to eliminate uric acid is affected negatively. So, try to have low-fat or no-fat dairy products and plant proteins. This helps in lowering the amount of saturated fat in your body and hence is beneficial for treating gout. By taking in a low fat diet, you will be able to reduce risks f obesity, which is also associated with the development of gout. To make your immune system strong and to improve the health of your body, it is important that you take in lots of whole grains, vegetables and fruits in your daily diet. If you have a healthy body and strong immune system, you will be able to combat gout more effectively. 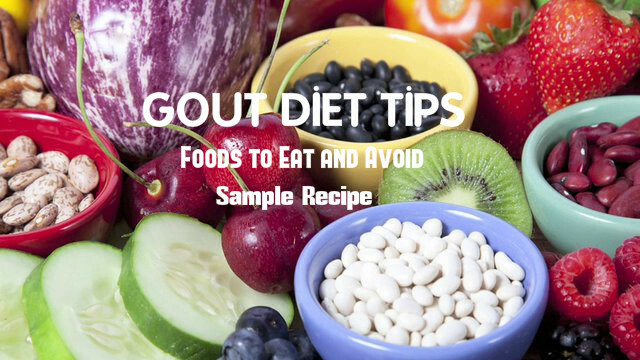 But make sure that you have only those fruits and vegetables that are effective for fighting against gout. Avoid vegetables like spinach, asparagus, peas, cauliflower, beans, lentils etc, which are rich in purine. These vegetables aggravate the symptoms of gout. Fresh cherries and strawberries are said to be beneficial for treating gout. Make sure that you take them in moderate amounts. Have organic cherries and strawberries. Tart cherries contain anthocyanins and bioflavonoids, which are powerful antioxidants that help in slowing down the enzymes cyclo-oxygenase-1 and -2. This way they help in getting you relief from gout and also prevent the disease. Strawberries are rich sources of antioxidants that fight against the free radicals and help in eliminating uric acid from your body. You can get relief from gout by drinking lots of fluids, especially water. This is because fluids help in flushing out toxins as well as uric acid from the body. Make sure that you consume at least 8 to 10 glasses of water daily. This helps in detoxifying your body and controlling your body weight; and is effective for maintaining a healthy body. Fructose is the only carbohydrate that is known to increase the level of uric acid in the body. So, it will be better for gout patients to avoid taking foods and beverages like soft drinks, juices and shakes that contain fructose-enriched corn syrup. Sugar is low in purines, but when you take a diet that contains large amounts of refined sugar, it may lead to conditions like obesity and diabetes. These can increase the problems associated with gout. You need not avoid fresh fruits, even though they contain sugar. You can consume them without any worry. This is because fresh fruits are rich sources of nutrients that are essential for a healthy body. When you suffer from gout, the first thing that you have t do is to avoid meat. Animal proteins are rich in purine and hence unhealthy for you. Organ meats, seafood and fish are rich sources of purine. So consuming these foods leads to the formation and retention of uric acid in the body. Gout patients must avoid such foods as they increase the symptoms associated with gout. Anchovies, scallops, pork, sardine, beef, bouillon, lamb etc are also be avoided by gout patients. When you follow a diet to control gout, it is very important that you avoid consuming alcohol. Alcohol prevents proper detoxification and removal of excess uric acid from the body. All alcoholic drinks cause increased formation of purine in the body. But beer is the worst of them. This is because of the brewer’s yeast present in beer. This is high in purine and immediately increases the level of uric acid in the body. As a result, drinking of beer increases the intensity of gout attacks. Unsweetened cereal, whole grain and skim or low-fat milk.